Larry Prater sees walking and jogging as a way to keep his health on track. In the 1980s, Prater would run about 100 miles a week to get in shape and lose weight. 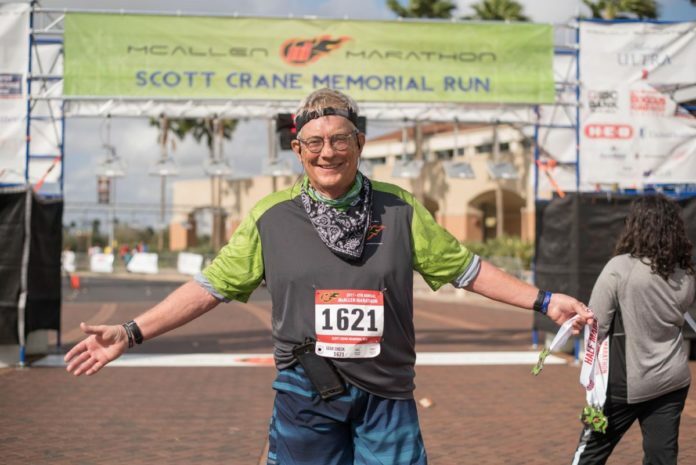 Nowadays, the McAllen resident says he takes on the trails to promote strength within his body to help him fight cancer. QUESTION: How did you start running? ANSWER: I started in my mid-30s because I was overweight, smoking too much and scared (for my health). A: Mission Hike and Bike Trails on South Conway in Mission. I’ve run many races there and the single-track trails in the brush are fun. A: Biggest was the San Antonio Rock N Roll Marathon. All events are special, though; each is unique and enjoyable. A: I remind myself that I’m always happiest when I’m out running or hiking and that my time on earth is limited. So, I convince myself to make myself happy and make use of the here-and-now. Q: Have you received any medals? A: I have a ton of medals, both for participating and for placing in my age group. A: Start running. Run every day, if you can. Never stop running unless you cannot do it. Q: Will you be participating in the McAllen Marathon in January? Why or why not? A: Yes! I’ve participated in every one at the half-marathon distance. A: Running and walking are everything to me now. I had the lower lobe of my lung removed in January, went through chemotherapy in March and April, had radiation therapy from June to August. I missed a lot of workouts and races but I’m back on track and hoping to walk the Brownsville Half Marathon in October. Walking is what keeps me sane. I am a better man for a daily 5K jaunt.